Los Angeles, CA – At approximately 9am this morning, an animal transport van belonging to the Society for the Prevention of Cruelty to Animals Los Angeles (spcaLA) was stolen while parked in front of the PetSmart Charities™ Everyday Adoption Center by spcaLA in Pico Rivera Towne Center. The vehicle is a 2002 Ford Econoline E150 Cargo van with license plate number 6Z25146. Items stolen within the van include 20 stainless steel pet crates, veterinary paperwork, various pet supplies, and personal items. Luckily, no animals were inside the van at the time of the theft. No security camera footage is available from the shopping center. spcaLA is relying on an eye witness, or an individual who’s spotted a van matching the Ford’s description to come forward. Individuals with information about the theft are urged to contact the Los Angeles Sheriff’s Department Pico Rivera Station at (562) 949-2421 and reference case number 918-800141520-093.
spcaLA relies on the generosity of donors to provide vital services for the people and animals of Southern California. 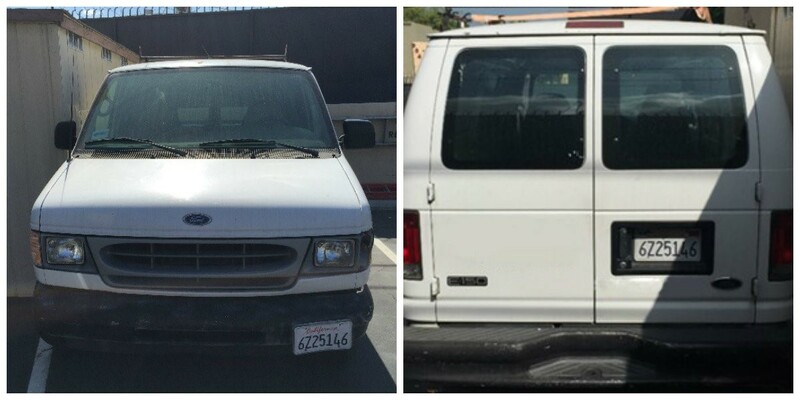 To help spcaLA replace the vehicle, and its contents, donations can be made at HERE or by calling (888) 772-2521.